Good that you have completed (Bachelor of Business Administration) BBA. So what are your next plans? You must be having a gap of 1-2 months until you decide a job or apply for higher degrees. Why not think of doing some short term courses after BBA in the interim period? Well, you might say, I am not sure if my parents will give me money to do short term courses after BBA. It’s understood. But you know as soon as you finish these short term courses you can get jobs in tech companies. And you can do these jobs as part and earn extra income for your family. Moreover, you may plan to do your (Master of Business Application) MBA or any other degree courses. Furthermore, tell your parents that you will study the degree course. And do a tech job as part-time or even from home in the evenings. Is that not a good idea? You start earning while you are still studying. 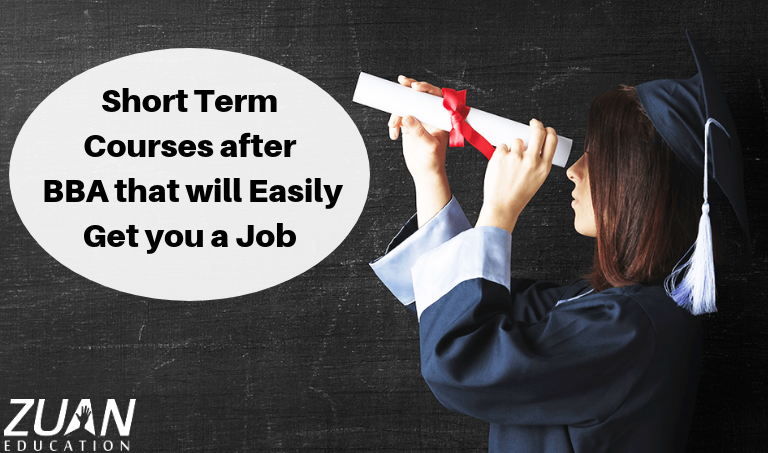 Therefore what are the short term courses after BBA? Doing marketing online. What will you learn in Digital Marketing? You will learn to do marketing through Facebook, Twitter, WhatsApp etc. You will learn in detail about marketing and Search Engines like Google, Bing etc. Furthermore, you will learn exciting online advertising. You will know the tactics of attracting customers in business. Significantly and interestingly, you will be taught how to technically analyze your business growth. You will come to know how content on a webpage should appear. Specifically, you will be taught to do marketing with your smartphone. At the end of the course you will get an industry-oriented job certificate. For anything and everything you search Google. Isn’t it? And Google gives you the answers you want. How? For example you are searching “second-hand mobile phones in chennai”. You want a smartphone urgently. As soon as you type these words Google will collect contents related to your search words and give it to you. That means people who plan to sell hand mobile would have directly or indirectly used the words, “second-hand mobile phones in chennai”. Input of such similar terms is called Search Engine Optimization (SEO). So what job will you get after learning SEO course? You will work in companies and do SEO works to promote their product and services. You will get a job as a Search Engine Optimization (SEO) Analyst. And you will be paid Rs. 179,881 per year. This is a worthwhile course after your BBA graduation. This is a vital course to do after you completed BBA. Let us take for example your family runs a big supermarket in the city. You want the online users to know about your supermarket. So what will you do? You can advertise your business on Facebook, Twitter, and other social networks. This will reach many young people. Firthermore, posting regularly about your product sale will get more customers for you. Therefore this marketing through social media channels is called Social Media Marketing. Significantly, learning Social Media Marketing course is best among short term courses after BBA. How to attract an audience, give value for followers, and develop a brand. Markedly, to run marketing campaigns on platforms like Facebook, Twitter etc. Significantly, know the large-scale range and risk of social media. Eventually, build a social media strategy to create a vision and reach your business goals. This is another significant course to do after your management studies. Instead of doing a diploma course you can do this PPC course and earn money quickly. Let me give you a rough idea about what is Pay-Per-Click (PPC)? Have you seen ads popping up on the top, bottom and side of a web page. This course deals with such ads. PPC is one of the greatest ways of doing Direct Online Marketing. Particularly, PPC results are quicker when compared to SEO operations. Significantly, PPC is best for startup businesses who are planning to attract more customers. Furthermore, you will be hired as a PPC expert with a high paying job in MNCs and corporates. Markedly, as a Pay-Per-Click (PPC) Analyst, you will earn an average salary of Rs. 233,306 per year. No doubt you will be used to emails. Specifically, you will get your first job appointment letter after doing the Email Marketing course only through email. What will you learn in this course? As indicated this is one among the vital courses after graduation. How to send emails to get the attraction of more customers to your products. Learn to send effective customer-oriented emails. Furthermore, you will learn to do email campaigns that are exciting. Significantly, you will learn different email service providers and frameworks. Learn to target through segmentation of emails and a host of other things. Your average salary as an email marketing specialist will be Rs. 301,571 per year. Promoting and selling other peoples products online is called Affiliate Marketing. This is an easy money earning course among short term courses after BBA. Tracking your publisher network etc. Once you complete this course you can do affiliate marketing even from home. You get a commission for every product you sell. You get an average of 250K-271K per year as an affiliate online marketing executive. In your BBA you would have learnt a subject on Business Analytics. And you may be thrilled about using those analytical skills to earn money. Well then you have fun collecting, analyzing a company’s data. Eventually, you can make data-informed decisions for the company. This will lead to the optimization of company’s digital ecosystem and maintaining business processes. A point to mention here is that Google Analytics is a great tool that gives insights into your digital marketing activities in a company. Moreover, it is essential to creating a successful online presence. This course will mainly concentrate on using tools like Google Analytics. Moreover, analytics is an important factor among management skills. It’s over to you guys. What will be your next step after reading about these many short term courses after BBA? Don’t waste that 1-2 months gap after completing your BBA. You can share your doubts and views about doing a short term course in the comment section to get appropriate guidance. You know even many post graduates opt for such short term courses instead of doing a PG diploma. There is no eligibility criteria or entrance exams to do these short term courses. You can just enter into any of the leading private professional institutes and straight away enroll for a course. You may take up any course after BBA, like human resource, mass communication, or PG courses in any institute of management. But before all that, having any one of the handy short term courses after BBA will help support your economic life in the future. Bye Friends. Waiting for your Comments and Queries below.